It's that time of year again: time to revisit the Late Cretaceous Hell Creek Formation for yet another fantastic "fossil hunt!" 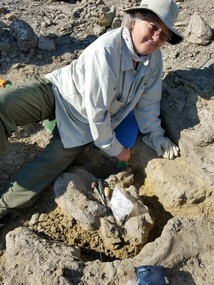 So, we invite all, from rookie paleontologist to pro, to join Forest Service Paleontologist, Barb Beasley, as we gather data and fossils to help manage this incredible natural and historic resource. Our project, as always, will take place in two parts - the field, then the lab - (see PIT website for 'Part II:" "Fossils Are Free At Last!" June 25-30, 2018). Part I, from June 18-23, will consist of scouring the Late Cretaceous badlands of the Formation, located on the Custer-Gallatin NF of northwest South Dakota. During this field phase, volunteers will learn to recognize, document, and collect fossils such as palm fronds, dinosaurs, crocodiles, and clams...just to name a few. Our remote campsite is in a beautiful forest and grassland setting about 50 miles north of the scenic and historic Black Hills. So, come for the fossils, dust, and camaraderie, stay for the views - and "Part II." See you this summer!